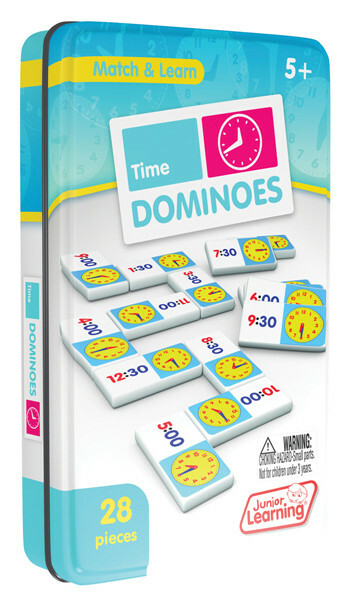 Children will become confident in telling the time by matching analogue and digital displays to win this exciting dominoes game. Perfect for encouraging individual learning. Includes 28 thick plastic dominoes in a collectors tin for easy storage. Each player takes 7 dominoes. One player places a starting domino. Each player takes turns matching the end of a domino to for a chain. If a player can't place a domino, then they must pick up a spare from the pile. The player to play all their dominoes first wins.